I received a parcel this week from the American skincare brand Kiehl's to try out two of their newest serums. The Daily Reviving Concentrate is a lightweight facial oil filled with antioxidants and natural oils including ginger root, sunflower and tamanu which keeps skin looking radiant and fresh. The serum strengthens the skin's defenses against pollution which - as I cycle to work on London's polluted roads each day - works for me. The refreshing smell wakes you up in the morning and it leaves skin hydrated but not shiny, for a perfect make up base. 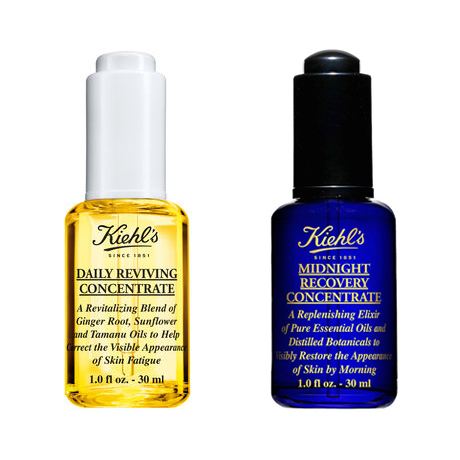 The Midnight Recovery Concentrate is an overnight elixir which helps repair and regenerate your skin with naturally-derived ingredients like Squalane, Evening Primrose, Omega-6 Fatty Acids and a blend of essential oils. Use a couple of drops each night for smoother, healthier skin by morning. I'm only on day two of both, but so far so good!